Praying Mantis in Your Garden? 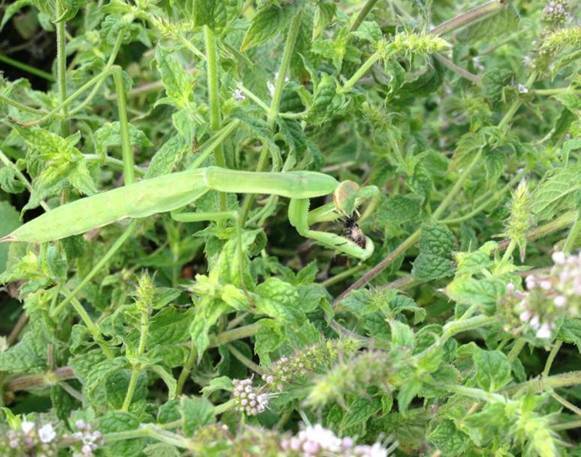 My gardening friend Janis Steed sent me this picture of a Praying Mantis eating an insect in her Hyssop. She encourages Praying Mantis in her garden by being careful to not destroy any egg mass she finds while cleaning up her perennial garden in fall. She carefully leaves and protects the egg mass on the twig or cutting so the young will populate her garden in spring. Praying Mantis love to eat aphids and other insects. The only downside to having a population of Praying Mantis is they also eat pollinators like bees and other beneficial insects. Click here if you want to study up on these very interesting insects so you will know what to look for while cleaning up your perennial garden this fall or winter. If you get a chance, watch a fascinated kid stare at a Praying Mantis stalking and chomping on its prey. It might be better than a video game!